Natural Remedies by Kevin Flatt. If you are searching for information on improving your health with less drugs and more natural remedies, then this website is for you. Most of the information on this website is fully referenced. A man's health can be judged by which he takes two at a time - pills or stairs. ~Joan Welsh. He who has so little knowledge of human nature as to seek happiness by changing anything but his own disposition will waste his life in fruitless efforts. ~Samuel Johnson. Cocoa powder contains more beneficial antioxidants than other chocolate products, but processing decreases their contents. Those are the results of a study by Agricultural Research Service (ARS) scientists and their cooperators interested in the total antioxidant capacity and procyanidin levels of six chocolate and cocoa products: natural (unsweetened) cocoa powders, Dutch processed (alkalinized) cocoa powders, unsweetened baking chocolates, semi-sweet chocolate baking chips, dark chocolates, and milk chocolates. Chocolate and cocoa powder are derived from beans that contain hefty quantities of natural antioxidants called flavonoids. The researchers found natural cocoa contains the highest capacity of the antioxidant procyanidin. Antioxidants are thought to be effective in helping to prevent cancer, heart disease, and stroke. Ronald L. Prior, an ARS nutritionist at the Arkansas Children's Nutrition Center (ACNC) in Little Rock, Ark., presented the study's results in San Diego, Calif., today with Liwei Gu and Xianli Wu of ACNC and Jim Harnly, a chemist at the ARS Beltsville (Md.) Human Nutrition Research Center. They presented the findings at Experimental Biology 2005, an annual meeting that brings together 16,000 biological and biomedical scientists from dozens of different disciplines. The researchers found natural cocoa powders contained the highest levels of total antioxidant capacity and procyanidins, which were found to be the dominant antioxidant in chocolates. Milk chocolates, which contain the least amount of cocoa solids, had the lowest total antioxidant capacity and procyanidin levels. Baking chocolates contained fewer procyanidins, because they contained more fat (50-60 percent) than natural cocoa. Alkalinization, used to reduce the acidity and raise the pH of cocoa, such as Dutch chocolates, was found to markedly reduce procyanidin content. Researchers concluded that chocolates containing higher amounts of cocoa ingredients have higher procyanidin contents, therefore, higher antioxidant capacities. Nine major manufacturers provided commercially available chocolate and cocoa samples and the National Institute of Standards and Technology provided its Standard Reference chocolate for analysis. 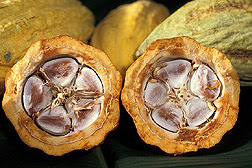 The study was partially funded by a grant from the American Cocoa Research Institute. Source: Jim Core, U.S. Department of Agriculture, Agricultural Research Service. Photo courtesy USDA, ARS. Used with permission. Can Grapes Prevent Type 1 Diabetes? Copyright 2007 Kevin Flatt. Reproduction of any information on other websites is PROHIBITED. Disclaimer: The information and opinions on this website is for information purposes only and is believed to be accurate and sound, based on the best judgment available to the author. Readers should consult appropriate health professionals on any matter relating to their health and well-being. Readers who fail to consult appropriate health authorities assume the risk of any injuries.